This colloquium will explore the implications of redefining UTC in astrodynamics, astornomy, geodesy, navigation, remote sensing and related fields. It will take place at the Analytical Graphics offices at 220 Valley Creek Boulevard in Exton Pennsylvania, near Philadelphia. 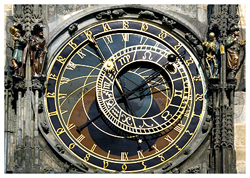 Civil timekeeping is based on Universal Time – the conventional measure of Earth rotation and astronomical time-of-day. Since 1972, Coordinated Universal Time (UTC) has been the broadcast convention for labeling uniform atomic seconds so that civil clocks remain synchronized with Universal Time of day to better than one second. A proposal to redefine UTC and halt the contribution of "leap seconds" to UTC after 2017 would also end the requirement that time services transmit the difference between UT1 and UTC. If approved, UTC would no longer be useful as a type of Universal Time for most technical applications and it would affect many applications and infrastructures. Applications that do not apply Earth Orientation Parameters and/or DUT1 corrections to UTC would be most affected. Registration is open at the website below.